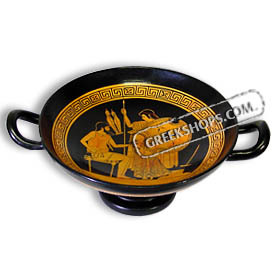 GreekShops.com : Greek Products : Amphora & Kylix Collection : Red Figure Kylix ( wine cup ) Hephaestus / Thetis 15 cm (5.9") diam. [Code : P8_118_kylix_15cm] Red Figure Kylix ( wine cup ) Hephaestus / Thetis 15 cm (5.9") diam. Hand-made ceramic replica depicting a mythologial scene on interior, and geometric Greek key band around outside. The scene involves Hephaistus who is producing a helmet for Thetis, a sea nymph and mother of Achilles. Hepahaestus was the god of technology, blacksmiths, craftsmen, artisans, sculptors, metals, metallurgy, fire and volcanoes. When Hephaestus was thrown from Olympus, whether cast out by Hera for his lameness or evicted by Zeus for taking Hera's side, the Nereids Eurynome and Thetis caught him and cared for him on the volcanic isle of Lemnos, while he labored for them as a smith. See additional photos for details. A beautiful addition to your household, or a wonderful gift. Approx. 15 cm (5.9") in width (diameter) and about 3 inches in height. Red-figure vase painting is one of the most important styles of figural Greek vase painting. It developed in Athens around 530 BC and remained in use until the late 3rd century BC. It replaced the previously dominant style of Black-figure vase painting within a few decades. Its modern name is based on the figural depictions in red color on a black background, in contrast to the preceding black-figure style with black figures on a red background. Red figure is the reverse of the black figure technique. After the unfired vessels had dried to a leathery, near-brittle texture, paintings were applied. In Attica, the normal unburnt clay was of orange colour at this stage. The outlines of the intended figures were drawn either with a blunt scraper, leaving a slight groove, or with charcoal, which would disappear entirely during firing. Then, the contours were redrawn with a brush, using a glossy clay slip (a liquid clay and mineral mixture).